Persistence Market Research, in its recent study on the waste management equipment market, offers a detailed value-volume analysis of the waste management equipment market on the basis of various segments such as product type, form, waste type, application and region. In terms of product type, the dumper truck type segment is estimated to lead the market share in terms of value, while on the basis of volume, the shredders segment is projected to capture the maximum share in the waste management equipment market. Waste management equipment find a large number of applications in sectors, such as municipal, commercial dry waste, construction waste, chemical waste, and medical waste, which require the use of simple or complex waste management equipment in their day-to-day operations. With these applications projected to witness significant growth in the coming years, the waste management equipment market is expected to experience robust growth opportunities over the forecast period. The waste management equipment market report covers market analysis through basis point analysis (BPS), incremental dollar opportunity index, market attractiveness analysis and Y-o-Y growth for the historical period 2013 – 2017 and a forecast analysis for 2018 – 2028 with 2017 as the base year. 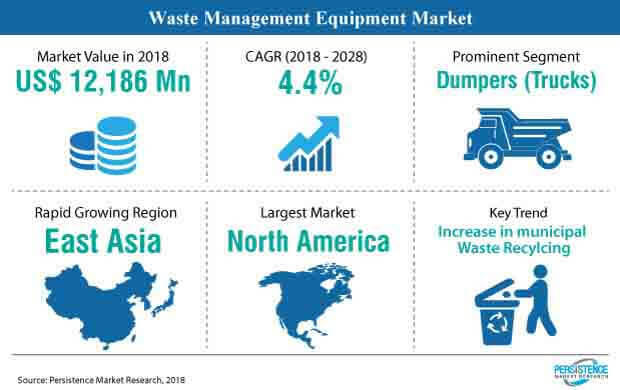 The waste management equipment market report begins with an executive summary covering a gist of the overall report, highlighting the global waste management equipment market overview in terms of value and volume through various segments. The section also covers key supply and demand side trends, technology roadmap, PMR analysis and recommendation on the global waste management equipment market. The market introduction section of the report covers market definition, market taxonomy and research scope of the waste management equipment market. The market background section of the global waste management equipment market report includes macroeconomic factors along with value chain analysis, drivers, restraints, trends, and opportunities, along with forecast factors affecting the waste management equipment market growth. The market forecast section provides a pricing analysis of the waste management equipment market on the basis of regional fronts, wherein the weighted average price has been computed to arrive at the global average prices. This section also covers global market analysis on the basis of segments, along with regional segmental analysis in terms of volume and value, Y-o-Y growth, market attractiveness index and market share. This section covers the waste management equipment market analysis for the key emerging countries that are projected to create lucrative growth opportunities for waste management equipment manufacturers around the world. In the final section of the waste management equipment market report, a detailed competition analysis was done with a market share analysis pertaining to the waste management equipment market and performance of manufacturers by a tier-down structure of the global waste management equipment market. The section also covers detailed company profiles of key players in the waste management equipment market report. Examples of some of the key competitors in the waste management equipment market are Dover Corporation, Buhler AG, Heil - An Environmental Solutions Group Company, McNeilus Truck & Manufacturing, Inc., Wastequip, LLC, Tomra Systems SA, Blue Group, and General Kinematics Corporation. The first stage of the waste management equipment market research entailed the formulation of a preliminary hypothesis, which was considered from primary as well as secondary approaches. To analyse the waste management equipment market share and competition analysis section, we tracked key developments in the waste management equipment market, such as collaborations, expansion, mergers & acquisitions, new orders, product launches, awards and recognition for companies operating in the market. Competition benchmarking has been provided for the top five competitors with respect to sales performance of waste management equipment. The global waste management equipment market was valued at nearly US$ 11 Bn in 2017. The waste management equipment market is pegged to observe robust growth with a 4.4% CAGR over 2018–2028. North America and Europe are expected to remain the largest regional markets for waste management equipment throughout the forecast period. Increase in municipal waste, stringent government regulations in North American countries such as the US and the presence of one of the biggest manufacturing hubs in Europe are expected to be the key factors driving the demand for waste management equipment. South Asia and East Asia regions are expected to create high growth opportunities for the manufacturers of waste management equipment over the forecast period. Rapid growth of end-use industries in the region, coupled with the thriving economy, is expected to be the key factor contributing to the growth of the waste management equipment market within these regions, particularly in rapidly growing economies such as China and India. Shredders are expected to remain a high volume segment in the waste management equipment market, owing to the simple construction and wide applications of this equipment in municipal waste management. Shredders are machines used for many applications such as municipal waste recycling and commercial dry waste, to name a few. Food wastage has grown significantly over the last few years. As per the Food and Agricultural Organization of the United Nations, roughly one-third of the total food processed for human consumption is wasted yearly, i.e. approximately 1.3 Billion Units. Food wastage is growing at a significant CAGR. Growing environmental effects are making consumers more inclined towards industrial waste recycling. Increasing awareness among consumers about the importance of reducing industrial waste is the primary driver for industrial waste recycling equipment. A major part of the global waste in developed countries is generated by the industrial sector. The demand for industrial waste recycling machines around the globe is anticipated to grow at a rapid pace, owing to the anticipated increase in growth avenues in the global industrial waste management equipment market in the coming years. Population growth around the globe has been one of the major factors impacting every major industry. With the ever-growing population, solid waste generation has also increased considerably over time. Furthermore, with growth in industrialization and services, migration of population from rural to urban areas has also been on the rise. Hence, population growth is expected drive the demand for waste management equipment during the forecast period.